1978 Suzuki custom of Thomas J. Albarano of Cooper City, Fla. 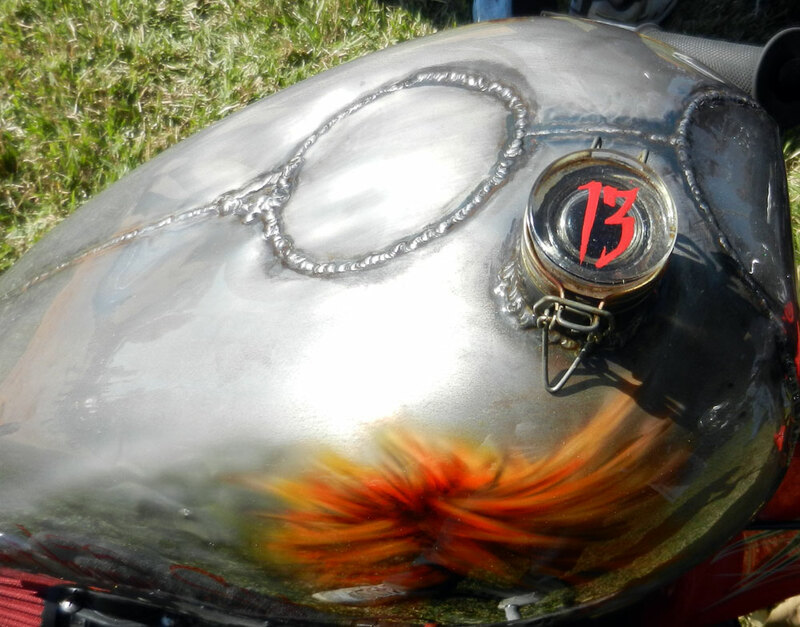 Sometimes it's the accessories that make a custom motorcycle really stunning. These little surprises delight the mind and the eye. 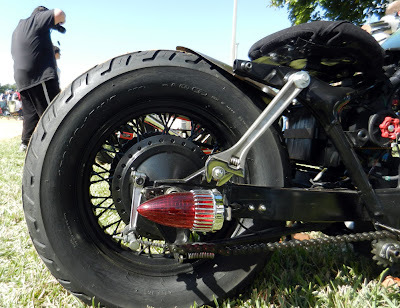 Plenty of examples of this were on view at the Dania Beach Vintage Motorcycle Show Jan. 26. 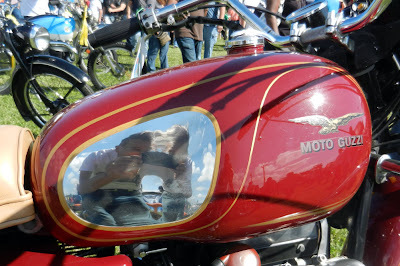 The custom motorcycle above was one of my favorites. It's a 1978 Suzuki with an adjustable wrench for a suspension strut and tail lights from a space commander's rocket ship. 1978 Yamaha from Fort Worth, Fla.
A Yamaha XS400 had its gas filler relocated and replaced with a snap-off jar lid. Why? I don't know, but I like it. Norton side stand is impressive. 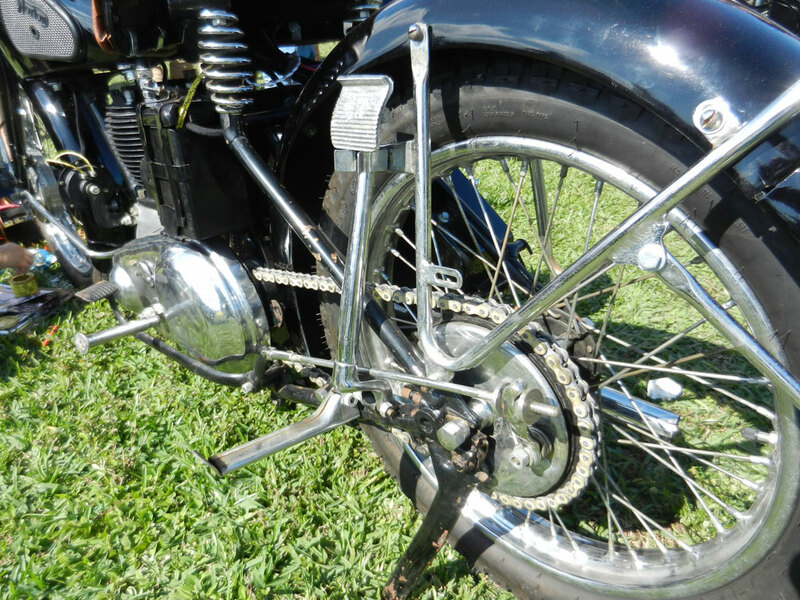 A vintage Norton sported a chrome side stand to end all side stands. It wasn't in use. I wonder if it works or just looks amazing? Chrome spot for your knees on the Moto-Guzzi of Robert McKee of Fort Lauderdale, Fla. The chrome knee patch on the tank of this 1972 Moto-Guzzi 750 Ambassador completely reverses my idea of where paint and chrome belong, but it looks great. It's not a custom touch; apparently they came this way. It suggests the importance of keeping an open mind. Simple wing nut holds simple saddle bags to naked fender. 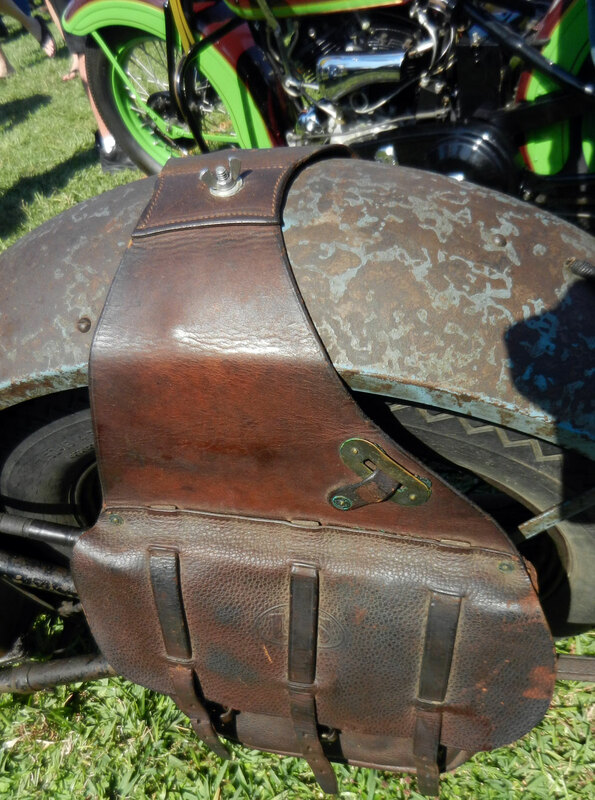 Simplicity of design or simple necessity must have inspired the single wing nut fastening a set of saddle bags to one old Indian. Simple stealth technology on a Chang Jiang. 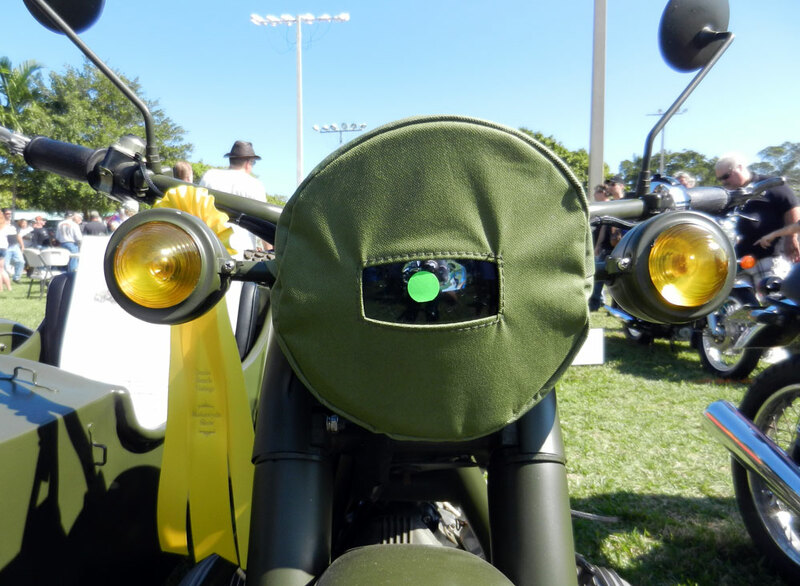 You've seen the elaborate tin "black out" hoods on British motorcycles of World War II but here's a far simpler canvas version on a Chang Jiang 750 M1S military sidecar tug. 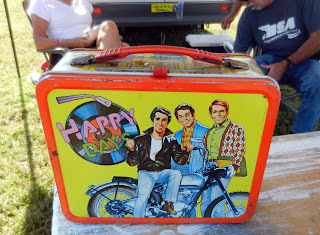 But perhaps the cutest accessory I spotted wasn't even attached to a motorcycle. The "Happy Days" lunch box sporting Fonzie and his 1949 Triumph Trophy looked fine all by itself.